March 13, 2018, 3:07 p.m.
Plus: Continued steady, unsexy growth for podcasts, The New York Times tries windowing with Caliphate, and in-car podcast listening is growing while audiobook listening stays flat. By Nicholas Quah March 13, 2018, 3:07 p.m. Welcome to Hot Pod, a newsletter about podcasts. This is issue 155, published March 13, 2018. Infinite Dial 2018. In the run-up to every Infinite Dial — the annual report from Edison Research and Triton Digital presenting what is, in my opinion, the definitive sizing on podcast listenership due to its assiduousness and the simple fact of its continuity — my stomach tends to produce a little knot. Part of writing this newsletter every week involves a suspension of disbelief, some taming of the nagging sense that all of this is so new, so strange, so tentative. Now, I’m not the kind of person who is certain of anything, from the shape of the world in five years to the muffin I’m planning to eat once this issue goes out, and so in the lead-up to the report, I often find myself prepared for a severe reality check. Looks like those preparations weren’t necessary — at least not for another year. The numbers are in, and they continue to look good. Will there ever be any other kind? The share of Americans who report listening to podcasts within the last month — which remains the key metric I track — is now 26 percent (73 million), up from 24 percent (67 million) the year before. To put it another way: a little more than a quarter of Americans can now broadly be considered active podcast listeners. That said, it’s a smaller year-over-year growth than the preceding period. The jump in podcast listenership between 2018 and 2017 is only two percentage points (or 6 million Americans), which is a little less than the three-percentage-point gain (or 10 million Americans) between 2017 and 2016. Is this deceleration noteworthy? I’m not sure, but I think it’s worth taking a step back and contextualize within the bigger picture: between 2014 and 2018, monthly American podcast listenership has grown by a whopping 73 percent. No matter how you cut it, we’ve come a long way. In the webinar, Edison Research SVP Tom Webster singled out the following data point as perhaps the most interesting in the entire deck: for weekly podcast listeners, the average number of podcasts consumed per week is now seven. That’s up from the average number of five podcasts that was recorded in the previous two editions of the report. This is a pretty exciting finding, suggesting that not only are more Americans consuming podcasts, but more podcasts are being consumed. Which is to say: new listeners who are brought into the ecosystem are also being spread around. Webster theorizes that this development could have something to do with the daily podcast genre that’s been growing over the past year or so. I agree with this assessment, but I’d broaden the theory: I think it’s also the effect of growing podcast operations that have been more aggressive in being present within the lives of their audiences. This includes hard daily news products like Up First and The Daily, yes, but also high-output shops like Crooked Media, whose prolific multi-show publishing schedule blankets the media diets (and private lives) of their target audiences. In my mind, these efforts stand in contrast to podcasts that publish with comparatively less urgency and are designed more as intermittent experiences of delight and engagement — narrative shows, in other words, that fit into lives more like a magazine or a novella. It’s also worth considering how limited-run podcasts fit into this equation: S-Town, Dirty John, Heaven’s Gate, Atlanta Monster, etc. Given that the Infinite Dial report is largely a measure of perception, I wonder how these shows are understood as part of a basic listening diet? (3) A problem of retention? I’m still thinking about the conundrum articulated by Eric Nuzum, Audible’s SVP of original content, the last time I wrote up the Infinite Dial. In a nutshell, he argues that the big metric to watch is the disparity between Americans who report ever having tried out a podcast and Americans who report being monthly podcast listeners — in other words, a measure of the medium’s ability to efficiently retain new listeners and expand its active consumer base. From this breakdown, it’s noticeable that the retention ratio has more or less kept steady within a tight range over the past three years, aside from a drop-off between 2015 and 2016. This suggests an ecosystem that hasn’t really been able to improve upon its ability to proportionally retain new listeners despite the boom it’s experiencing. I’m curious to hear what you think about this framing, though, or if I’m using this statistic incorrectly. When people sample and don’t habituate, it speaks to interest that isn’t being met by the content that’s available today. There either isn’t enough variety of things for people to listen to — or there isn’t enough of what they like to meet their appetite. With 350,000 podcasts, that seems like a strange thing to say, but the simple truth is that potential listeners aren’t sticking with it — and there are only two potential reasons: not enough good stuff — or they simply can’t find it. Ah, the old twin-problems of programming and discovery. So, in the past, I’ve consistently argued against putting much stock into viewing discovery as the defining challenge of the podcast ecosystem, and for putting more stock into the issue of developing more types of programming for more types of people. Of course, it’s not an either/or situation, and sure, you’re totally free and justified to continue touting discovery as the final frontier. But I’d also encourage further interrogation of that perspective: what are we really asking for when we ask for better podcast discovery? Are we extending hope for a more aggressive platform that ultimately centralizes all knowledge, awareness, and conduct of podcast products? And to what extent are gripes of podcast discovery actually gripes against the relatively unexplored art of podcast marketing? So, this is cool: as expressed in the webinar, 2018 marks the first time that podcasting overtook satellite radio in the car, 23 percent to 21 percent. Podcasting still comes behind online radio (28 percent), owned digital music (45 percent), CDs (49 percent), and that steady behemoth, AM/FM radio (82 percent). In related news, the share of Americans with cars that feature in-dash information and entertainment systems is now 15 percent (or 42 million), up from 12 percent the year before. Anyway, be sure to check out the slide in the report that tracks year-over-year changes for all these in-car audio source categories. Notice how podcasting, by growing from 19 percent in 2017 to 23 percent in 2018, represents the biggest jump across its largely flat or receding peers, and how these in-car podcasting gains track greater than podcasting’s overall growth. There is so much room for growth here, and I think it has everything to do with the friction of the in-dash entertainment user experience. Watch that scene closely. That Very Big question was posed during the presentation, and it’s absolutely worth unpacking. This year, the share of Americans who report being familiar with the term “podcasting” is 60 percent (or 168 million), which is a far cry from the years when this stat stayed flat — between 2009 and 2014, that share was trapped within 45 percent and 48 percent. Edison Research made it a point to emphasize how this data point on term-familiarity is a reflection of awareness, not comprehension, and so even though a big share of Americans report having heard of the concept, it’s not any literal indication that they understand what it specifically means: the podcatchers, the RSS feeds, the distinction against streaming or broadcast radio, the amorphous and vibrant culture that has emerged from its component parts, and so on. Which raises the question: what are we talking about when we talk about podcasting from a outward-facing perspective? What should we be talking about? Are we discussing a specific community or bundle of creators working within a particular paradigm of a shifting technological world, or are we referring more to a specific technology configuration of audio content distribution? For what it’s worth, and in case you haven’t noticed, I’ve largely stacked my chips on the former — not only because I’ve found it infinitely more productive as a framework to ground my coverage in this newsletter, but also because it’s the creative community that matters. The structural world will continue to change in vast and peculiar ways; the people, not so much. I think this is only going to become more true as we move forward in time and continue to see other platforms, technical infrastructures, and distributional opportunities converge to further interact and impact the identity of the space: from external platforms like Spotify and Pandora to the ruthlessly political world of the in-car dashboard, from new apps portending new ways of doing things to voice-first computing (née smart speakers), from in-closet productions to corporate products. It’s all audio, but it’s an audio of change. And so, I’m less curious about podcasting’s ceiling. As I’ve maintained before, I’m more curious about what we’re going to call it — and how we’re going to recognize it — in the years to come. Speaking of smart speakers, they’ve totally arrived, having invaded the lives of Americans everywhere. Smart speaker ownership doubled over the last year, now at 18 percent (or 51 million). Notably, the report observed that “smart speaker adoption is growing at a faster rate than the early days of smartphones.” Some of this might be attributable to the fact that Americans are probably more comfortable these days allowing intimate personal devices from major technology companies into their private lives, having already done so multiple times over. But it probably has more to do with the smart speaker — as a vessel of voice assistants (or voice-first computing) — being a particularly sticky product in the broader culture. One thing to note: there was some discussion about the curious growth of Amazon Music’s usage as an online audio brand — and how that indicates the strength of smart speakers in driving a certain of listening behavior. That’s the upside to the fight to figure out the ecosystem: to reap the benefits of becoming the default presence, brand, or experience on this rapidly-growing device category. Side note: I can’t stop thinking about how Google Glass, in hindsight, is probably some sort of multiverse branching point. I wonder how that parallel universe looks like, and what that Nick Quah is doing right now. This one’s really cool: the share of American men who consider themselves monthly podcast listeners has stayed flat (27 percent), but the share of American women has increased year-over-year: 24 percent, up from 21 percent the year before. The share of Americans aged 18-34 who don’t own a radio receiver in the home is now 50 percent. A decade ago, in 2008, that share was six percent. Among Americans who have ever listened to a podcast, 80 percent report typically consuming most or the entirety of a given episode. That’s a little down from 85 percent last year. Y’all should square this against what you’ve been finding with the new Apple in-episode podcast analytics. Only roughly one in five podcast listeners report speed-listening behaviors. Look, you’re just special. NPR One’s brand awareness is flat at 20 percent, same as last year. Also flat, interestingly enough: audiobook listening, which has hovered within 43 percent and 45 percent over the past four years. Shouts to Audible, one of podcasting’s blue chip advertisers. Okay, time to get out of this thread, lest Hot Pod becomes an Edison Research blog. Scenes from another report. While the Infinite Dial remains the industry’s gold standard report, I’m always hungry for more research. Atlantic Re:think, The Atlantic’s creative marketing group, has commissioned an upcoming whitepaper that hopes to generate more insight into the behaviors and preferences of podcast listeners. In particular, the study hopes to contextualize their podcast consumption habits within their broader media diets. The report takes pains to emphasize the thesis that these data points represent a world in which podcasts are outpacing — but not replacing — other forms of media, like television or digital news. This is in keeping with one of the fundamental arguments about podcasts: that it is the perfect medium to fill “in-between times” like commutes, exercising, cooking, etc. I think the thesis is broadly true, but with one caveat: we shouldn’t forget that podcasting directly competes with other forms of “in-between time”-oriented content sources, like, say, AM/FM radio or maybe the social graces of your roommates. Anyway, in addition to these findings, Atlantic Re:think’s report also touches upon the halo effects of podcast advertising and views towards branded podcasts. So if you’re interested in that kind of stuff, keep your eyes peeled for the report when it pubs. All the news that’s fit to serialize. New York Times Audio has announced its first serialized narrative nonfiction project: Caliphate, a limited-run documentary featuring the reporting of Rukmini Callimachi, the Times’ stellar foreign correspondent and in-house expert — probably the expert — on the Islamic State. The podcast is slated to debut later this spring, and working on the project are: Larissa Anderson, Wendy Dorr, Andy Mills, Asthaa Chaturvedi, Lisa Tobin, and Samantha Henig. Take note: subscribers to the New York Times will have early access to the audio documentary. A spokesperson confirmed to me that subscribers can cash in on the first-listen through the Times’ web and app platforms. This is the first time we’re seeing the Times audio team attempt a version of windowing that explicitly loops a podcast’s value proposition back into the organization’s broader subscription-first business strategy. The exact structure of the window — that is, how long before non-subscribers get to listen — remains unclear. I should also note that this technical gambit naturally extends from the Times’ recent move to ensure that it is able to directly distribute The Daily to listeners through its app. I like this move, by the way, and here’s why I think it’s different from other windowing campaigns we’ve seen so far: the Times already has a strong subscriber base that’s scattered across a range of media and platforms. As such, Caliphate isn’t made to bear the burden of needing to drive new conversions and spark new lines of businesses to justify its investment. Furthermore, the fact that the Times’ subscriber base is already significant means the project doesn’t run the risk of artificially capping any potential momentum it might generate off the bat. This raises a broader question: are audio windowing strategies only unambiguously strong when its attached to a mature and developed subscriber base? Anyway, for what it’s worth: this is the kind of show I was hoping to see from the Times the very second I heard they were assembling an audio team. Vast in ambition and consideration of the medium it will use, the project is poised to be a fine example of what we can get when a huge news organization leverages its resources to build a podcast-first news product — and not a product whose form or function is derivative of a separate broadcast or legacy infrastructure. Let me once again stan for Longform and re-up Rukmini Callimachi’s amazing two-part interview on that show. It’s one of my favorites from that podcast. Song Exploder dropped a special episode last week breaking down The Daily’s theme song. I heard that Sam Dolnick, the Times’ assistant masthead editor and NYT Audio superfan, was partially responsible for this collaboration. Look, my favorite Song Exploders are theme song exploders, and you should probably pair this with Hrishikesh Hirway’s unpacking of the Reply All theme. Okay. Now I’m going to break my daily news podcast moratorium to talk about Techmeme. Let’s go. Rewrite this headline. Techmeme, the highly influential technology news aggregator read by everybody from Sundar Pichai to that dudebro who just launched an app, has rolled out a new daily podcast that, well, delivers you a snippy roundup of the day’s most important tech news. 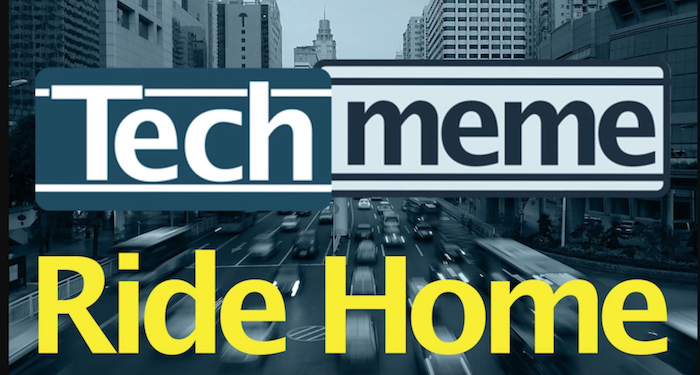 The show is called Techmeme Ride Home, and each edition — which runs between fifteen and twenty minutes — drops every weekday at 5 p.m. ET in its bid to hit the evening commute. Producing and hosting the podcast is Brian McCullough, the creator of the Internet History Podcast and author of the upcoming book How the Internet Happened: From Netscape to the iPhone. So, we both sort of brainstormed how to do it differently and we decided that Techmeme was good for two big use cases: quickly catching up on what was new in the world of tech; and — and I think this is crucial — giving the CONTEXT for what is going on… someone reported X, but someone else said Y about X, and someone else tweeted the real story about X. Here’s what it all means. So, our whole mission was to build off of Techmeme’s existing strengths: what did I miss, and what does it mean? He also posed the question: “Though daily news wraps HAVE been done, has news aggregation been done in a major way in pods before?” It’s a pretty interesting query, but if pressed, I’m tempted to think that the answer is yes, very much so, but mostly because I think the chat-show model that we see with the aforementioned Daily Tech News Show and TWiT — along with stuff like the Slate Gabfests that operates within other various news genres — represents a form of aggregation in its own way. But I get where McCullough’s coming from, and I have a sense that the kind of aggregation he’s raising is a matter of flash efficiency: an audio product that allows for quick downloads of the news. That, I believe, we’ve seen emerge with growing Alexa’s Flash Briefing content universe, and I suspect that’s the trend Gabe Rivera is tracking. Before I switch gears, I just wanted to link to Charlie Warzel’s nifty profile on Rivera and Techmeme, which you can read on BuzzFeed. Specific. McCullough was also eager to discuss what appears to be podcasting’s gradual introduction to day-parting, the broadcast programming practice of dividing the day into separate temporal parts whose audience profile possess different traits and needs. So, day-parting has been around since the 1920s because early on everybody realized that audiences have different expectations and different use cases for content at different times of the day. With podcasting, everyone fell in love with the time shifting aspect of the medium… But by focusing on that, producers ended up with a bias toward leisure listening (I’ll listen to this when I’m ready and want to chill out) and they forgot about the day-parting lesson of filling a listener’s need at a given time of day. I fully credit The Daily for reminding everyone about this: oh, I can listen to a podcast in the morning and feel like I’m educated on the recent zeitgeist! We’re trying to do a similar thing (in the reverse commute time) but the Ride Home moniker is just a suggested use case. Really, if you wanted to save up a week’s worth of shows and binge on the weekend, clearly you can do that too. I do think producers will be thinking more about meeting needs around people’s lives as they go through their day. THIS is the pod I take the gym. THIS is the pod I listen to to fall asleep (those exist BTW, and I find them fascinating!). Shouts to Drew Ackerman’s Sleep with Me, by the way. Anyway, I think day-parting can be further situated within a broader trend of how daily podcast news products can further dig into use-case niches to trigger the next phase of evolution. Cutting deeper into temporal chunks is one way to do, but so is slicing the genre up based on regions and locales, as we can see with the case of KQED’s recently-launch The Bay and ongoing efforts like AL.com’s Down in Alabama with Ike Morgan. There’s no telling where else it can go. Three updates from NPR: (1) Planet Money welcomes two new hosts: Sarah Gonzalez, formerly of WNYC, and Karen Duffin, formerly of This American Life; (2) Invisibilia is back with its fourth season; and (3) Hidden Brain celebrates its 100th episode. I’m skipping SXSW this year — it’s been an exhausting few months — but I hear there’s a bunch of podcast stuff that’s going on in Austin, including a couple of live shows and some announcements. Apple’s Eddy Cue took the stage yesterday, but that didn’t really generate anything particularly interesting for us. Still, it’s always worth keeping an eye on Cupertino. When whales move, the tides shift, something something. My reviews this week: West Cork from Audible, and from Marvel and Stitcher. POSTED March 13, 2018, 3:07 p.m.
Quah, Nicholas. "Enough with the “round-robin hot takes”: Techmeme tries a new kind of aggregation show." Nieman Journalism Lab. Nieman Foundation for Journalism at Harvard, 13 Mar. 2018. Web. 18 Apr. 2019. Quah, Nicholas. "Enough with the “round-robin hot takes”: Techmeme tries a new kind of aggregation show." Nieman Journalism Lab. Last modified March 13, 2018. Accessed April 18, 2019. https://www.niemanlab.org/2018/03/enough-with-the-round-robin-hot-takes-techmeme-tries-a-new-kind-of-aggregation-show/.